The National Pork Producers Council (NPPC) is offering two tours prior to the 2016 World Pork Expo that provide unique insights into U.S. agriculture. Set for June 6-7, the two-day tour will travel to locations in Illinois, Indiana and Iowa, showcasing commercial hog systems, farm equipment production and agricultural shipping channels. The one-day tour on June 7 will highlight agricultural businesses in central Iowa, with a look at modern swine production and food marketing, feed grain research and product development. The tours include transportation and meals on tour days, as well as free admission to World Pork Expo, June 8-10, featuring the world's largest pork-specific trade show. "This year's pre-World Pork Expo tours follow the long tradition of providing visitors with a snapshot of U.S. agriculture's diversity from on-farm hog production to product research and development to equipment manufacturing and shipping," says Greg Thornton, tour organizer for NPPC. 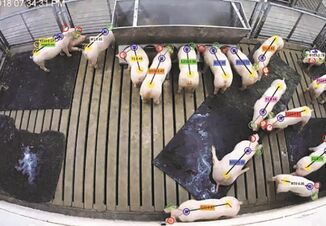 "While the tours are open to anyone, they are particularly informative for international visitors and can make their time at World Pork Expo even more meaningful." The two-day tour, underwritten by the Illinois Soybean Association, travels through Iowa and into Illinois and Indiana. Participants can board the bus in Des Moines on Sunday, June 5, or can meet the group at Holiday Inn Express in Chicago, on Monday, June 6. The tour will venture into Indiana to visit Fair Oaks Farms, home of The Pig Adventure for a view of modern pork production. Participants will dine on site at the Farmhouse Restaurant. The overnight stop will take place at Jumer's Hotel and Casino. On day two, the tour heads to the John Deere Harvester Works in East Moline, Illinois, and a new, state-of-the art JBS feedmill and a modern wean-to-finish barn managed by JBS. Participants also will get an up-close look at grain export activities during a barge trip down the Mississippi River. The tour bus will return to Des Moines for dinner on the evening of June 7. The one-day tour takes place on Tuesday, June 7, and will focus on agricultural businesses in Central Iowa. The tour will begin and end the day in Des Moines. This action-packed trip will include a look at crop and feed segments related to pork production with a stop at the DuPont Pioneer Research & Development Center. A visit to a modern wean-to-finish barn and a new, state-of-the art feedmill owned by JBS, followed by a stop at a Hy-Vee grocery store for perspective on the U.S. retail food sector and dinner at the iconic Machine Shed Restaurant completes the day's events. "These pre-Expo tours are a great way to get a sense of what U.S., and more specifically Iowa, agriculture is like. 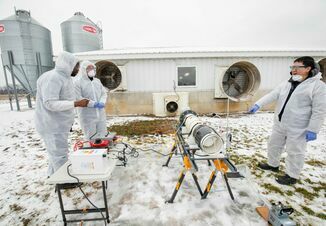 It provides participants with an up close and personal look, with opportunities to ask questions," says John Weber, NPPC president and Iowa pork producer. 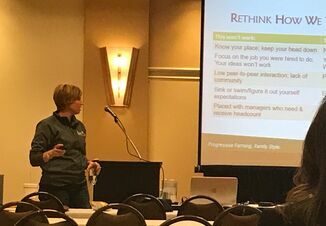 "Then tour participants can spend the following days at World Pork Expo for a look at the latest pork production technologies, products and services, as well as hearing leading experts discuss research and production tips during the numerous seminars offered." Both tours have limited space, so interested individuals should go to worldpork.org and register as soon as possible. Once there, select "Attendees" on the blue registration button. Then, scroll down to "Industry Tours." The website will provide updated details about the tours, as well as a schedule of Expo activities and general registration information. The site also offers information about room availability at official World Pork Expo hotels, answers to Frequently Asked Questions and other helpful tips about traveling to World Pork Expo.